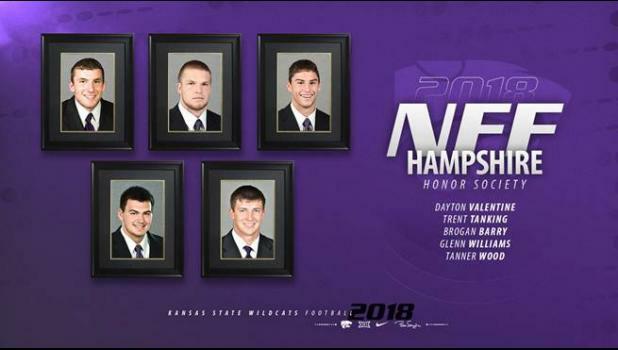 Five Kansas State players who recently completed their football careers – Brogan Barry, Trent Tanking, Dayton Valentine, Glenn Williams and Tanner Wood – have been named members of the 2018 National Football Foundation (NFF) Hampshire Honor Society, it has been announced. The five Wildcats named to the list were the most in the Big 12 League and were among an all-time high of 1,251 players from all NCAA divisions and the NAIA to earn the honor. The Hampshire Honor Society, which began in 2007, recognizes college football players from all divisions who maintained a cumulative 3.2 GPA or better throughout their college career. The five Wildcats named to this year’s society tied the school record originally set in 2015, while it is the fourth-straight year K-State has had at least four players named to the list. Tanking, an industrial engineering major, was a semifinalist for the prestigious William V. Campbell Trophy, also presented by the NFF, which is often referred to as the “Academic Heisman.” The Holton, product played in 47 career games, including starting all 13 games at linebacker in 2017. He finished second on the team in tackles with 97 en route to Honorable Mention All-Big 12 honors. He was a three-time First Team Academic All-Big 12 honoree. Valentine, who earned three-straight First Team Academic All-Big 12 honors, concluded his career after his junior season of 2017 as he played in 35 games with 27 starts at tight end. The Baldwin, native was a major part of the Wildcats’ run-blocking unit, so much so that he earned Honorable Mention All-Big 12 honors in 2016 despite only hauling in two catches that season. A product of Conway Springs, Wood played in 52 career games with starts in all 13 games as a senior. He was a three-time First Team Academic All-Big 12 performer who came away with 105 career tackles and 6.0 career sacks. Barry, who picked up two First Team Academic All-Big 12 citations during his career, saw action in 32 games, while Williams played in K-State’s victory over UCLA in the 2017 Cactus Bowl.